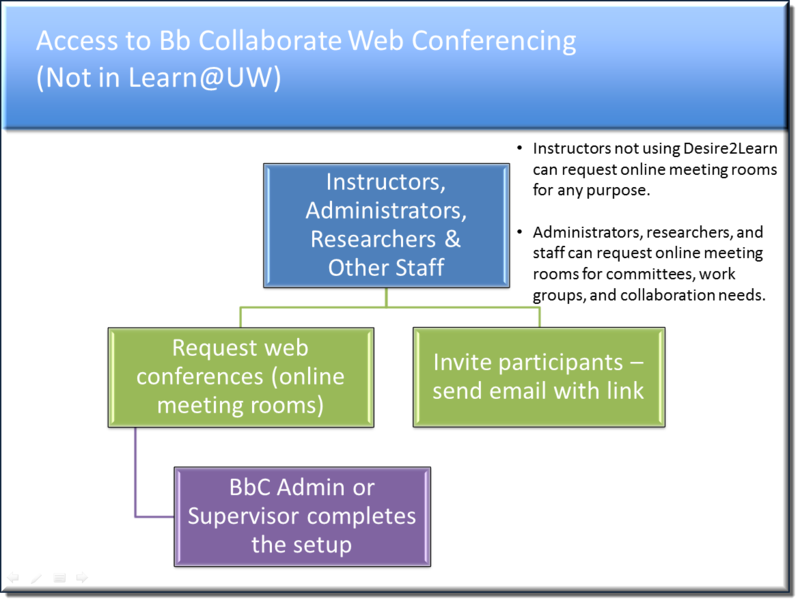 This document provides useful information for new users of the Blackboard Collaborate web conferencing service. You can access Blackboard Collaborate several ways. There are also multiple “roles” that have different types of access. Take a few minutes and think about how you will be accessing the web conference, and what type of role you will have. Moderator – The person conducting a session is a moderator; for example an instructor. Moderators have access to all Blackboard Collaborate interface features, including the ability to grant moderator status to participants. If you are accessing Blackboard Collaborate from the Learn@UW interface, you will be able to create sessions and add participants for your own sessions. If you are not using Learn@UW, a Blackboard Collaborate Supervisor will help you with some initial setup activities. Participant – Participants attend web conference sessions and have access to many of the interface features. Students may access Collaborate sessions from within a Learn@UW course or by clicking on a URL link from an email invitation. Participants may be students or any other type of UW employee or affiliate. Moderators can also give a participant the ability to function as a moderator during a Collaborate session. Access to web conferencing varies, based on whether you use the University’s Learn@UW course management system. 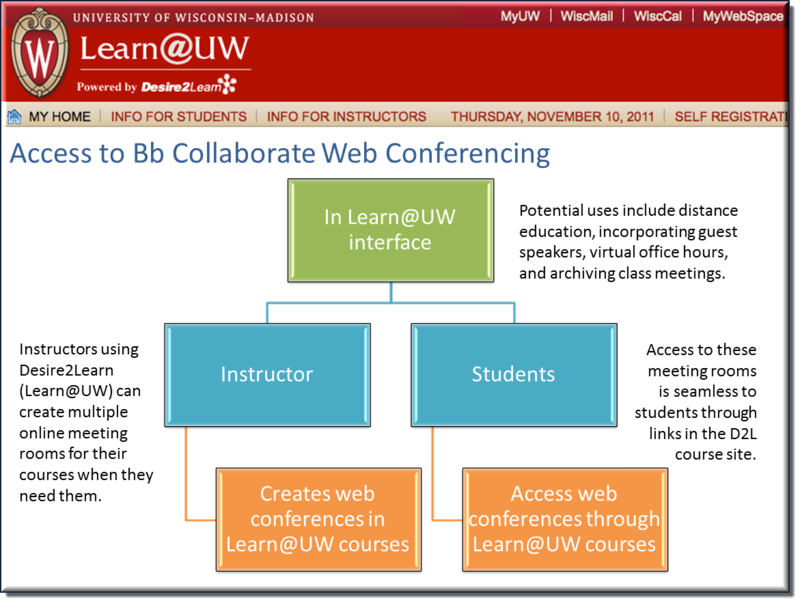 Instructors who use Learn@UW can add a link to Collaborate web conferencing right from a course in Learn@UW. This provides easy access to web conferences for instructors and their students. There is more information available; be sure to check the other links provided at the bottom of this page. Blackboard has a wealth of knowledge and information on their website, and we have also created documentation to support the Learn@UW integration with web conferencing. These resources have been pulled together into handy collections to help you locate the most relevant information. Training and support documents, quick reference handouts and training videos are divided into Moderator and Participant categories. You can also locate help based on how you access Blackboard Collaborate. Document 22145 is unavailable at this time. Document 21061 is unavailable at this time. Document 21062 is unavailable at this time. Document 21068 is unavailable at this time. Document 32625 is unavailable at this time. Document 21069 is unavailable at this time.